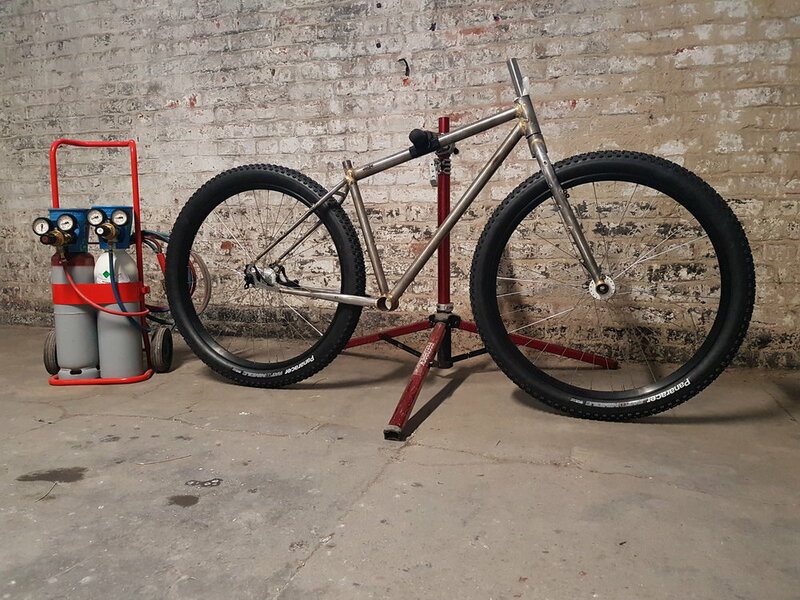 The only thing better than riding on a custom bike made to your measures and specific needs is building it yourself. Over more than a year I have worked with clients and enabled them to build their own frames for various types of bikes. 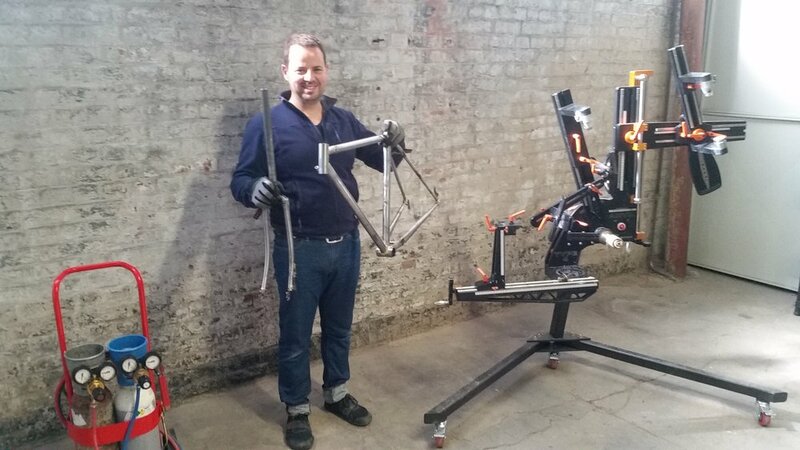 It enabled me to develop a frame building course that will allow you to create your own steel bicycle frame and fork within 5 days. The course is hosted in my workshop in Roubaix, in the very scenic setting of Le Non-Lieu, a retired textile factory kept as much as possible in its original state. 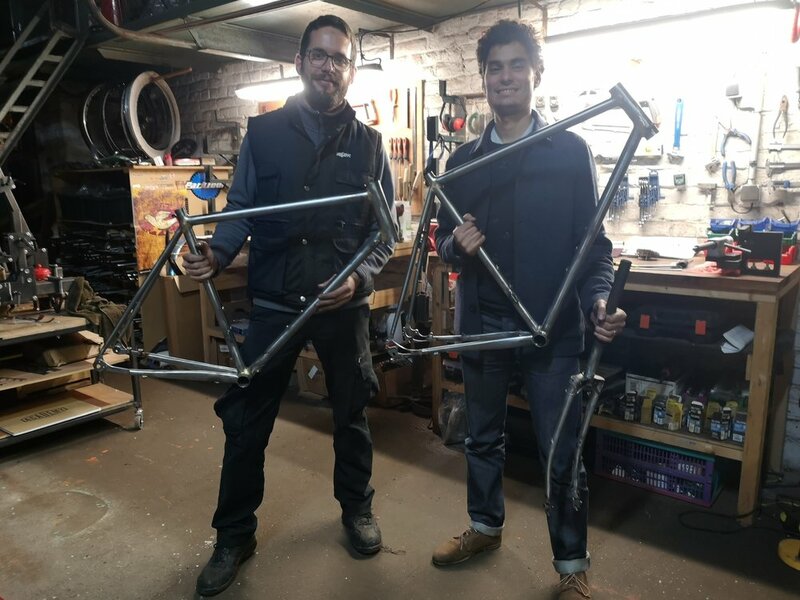 Being a professional frame builder, I provide my expertise and guidance, and supervise all the steps of the process to create your first frame. But you will perform all the steps yourself, including the mitering of the tubes and of course the brazing. My workshop is equipped with the necessary tools and machines to build a frame of professional quality, still involving a large proportion of manual work which more than justifies the description “hand-built”. You will create your frame using high-end steel tubing by renown manufactures such as Columbus or Reynolds. Tube sets by Japanese manufacturers Kaisei or Tange are also available upon request. Small parts and pieces, such as dropouts, braze-on cable stops or lugs come in standard iron cast versions or can be sourced from manufacturers such as Paragon Machine Works in the US for more demanding builds. A classic silver soldered lugged frame is timeless and ideal to start your frame building adventures. If you want to create a go-anywhere randonneur Rene Herse style, a road bike that will get you into the next Eroicca or a slick city whip fixie style, this should be your choice. Mountain bikes or the very popular gravel bikes, usually with disc brakes, require more liberty regarding tire clearance and tube angles. 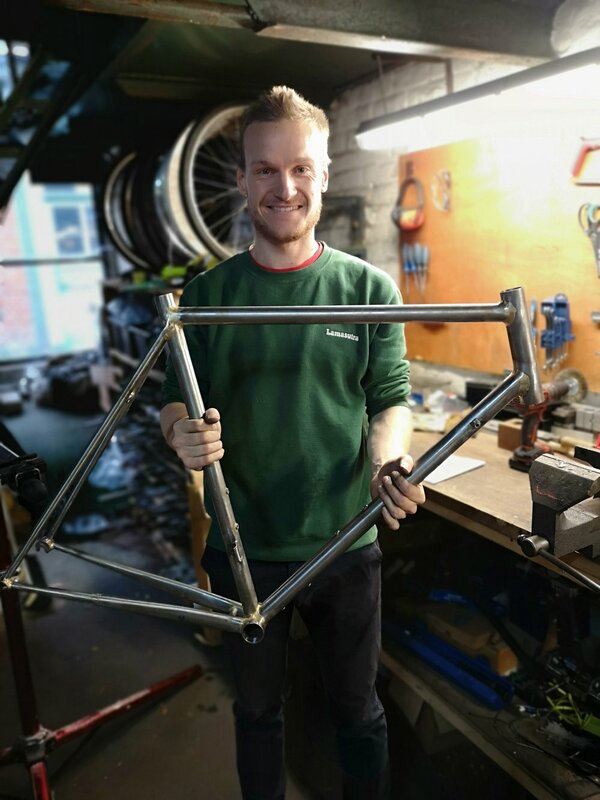 Those frames are usually built without lugs and tubes are assembled through fillet brazing. While this is a more complex method to build the frame where we will spend a little more time on practice pieces before working on the real thing, the course can still be completed within the 5-day time frame. Head tubes for 1” fork steerers, threaded or threadless (typically lugged frames), or 1 1/8” fork steerers. It is also possible to use a 44mm interior diameter straight head tube for tapered forks (e.g. 1 1/8” to 1 1/2”). Brake types: caliper or cantilever brakes, disc brakes for International Standard or post-mount. Flat-mount disc brake mounts are possible on the frame but not on the fork. Supported transmission types: all chain based transmissions (derailleurs and internal geared hubs). No belt or kardan drive, sorry. Frame preparation for internal lighting cable routing. No internal brake or gear cable routing, due to time restrictions, sorry. Lugged forks, offering a variety of fork crowns for all tire sizes up to 3”. No unicrown or segmented forks. The course to build frame and fork takes 5 days from Monday to Friday from 9am to 5pm. A four-day option is available if you just want to build the frame and no fork. In the program we are focusing on what is at the heart of frame building: the mitering of the tubes and their assembly through brazing. Keeping the course to 5 days requires that the preparation work has to be done before the actual course starts. I will contact you usually 5 to 6 weeks before the start of the course to discuss the frame design and options. If a visit to the workshop is not possible for you beforehand I will send you clear instructions how to take the necessary mesures to determine the frame sizing. The design is done with the dedicated frame building software bikecad. Lunches are usually prepared together with other occupants of the factory. Coffee is free. Participants are encouraged to bring samples of their local specialties (we’re in France after all). The prices include all consumables (gas, abrasives, flux to braze, bronze) and a protection mask. The prices do not include the cost of the material for your frame, i.e. the tubes, drop outs, braze-ons etc. The material cost varies with the type of bike. It’s usually around 250 to 350 Euros. To reserve your frame building course I will ask you for a deposit of half of the program fee. To request a booking, please fill out the form below with the desired dates and program type. You will receive the confirmation whether the course is available at these dates shortly. I can offer competitive prices for high-end components worthy to equip your hand-built frame by the following brands. Do not hesitate to ask for quotes! Made in France: Gilles Berthoud, Spécialités T.A. I am also able to help you sort out a paint-job of professional quality as well as hand-built wheels.